Colored pencil isn’t just a medium to use, it is also a learning tool. It allows you to teach drawing skills and teach about color at the same time. Just as her first book is an inspiring guide for botanical illustrators, Wendy Hollender’s Botanical Drawing in Color: A Basic Guide to Mastering Realistic Form and Naturalistic Color is equally inspiring, if not more. In her new book, Wendy reveals the mystery behind botanical illustration by breaking each step of the process down to minute detail. No detail is too small. Even the seemingly obvious detail of sharpening a pencil is addressed. Experience has taught Hollender that something as innocent as a blunt pencil can become an obstacle if not monitored properly. The step-by-step instructions Hollender provides in Botanical Drawing do more than carefully guide artists through new exercises. Through carefully written text and supporting illustrations, Hollender instills confidence in novice illustrators bravely embarking on their first attempt in botanical art and instills confidence in artists who may be exploring colored pencil techniques for the first time. What makes Botanical Drawing in Color a comprehensive guide to botanical illustration is Hollender’s careful arrangement of exercises, each exercise building upon the one before. This book is not a reading book. It’s a book that requires readers to take action. If the exercises are completed faithfully and in sequence, novice illustrators will find they are no longer beginners and colored pencil enthusiasts will be charged with their enhanced understanding of color theory and color harmony. Chapter 2 – Art Supplies & Materials: Hollender introduces the materials she uses and explains the reasons behind her choice of graphite pencils, colored pencils, paper, and other supplies. Chapter 3 – Tone and Form: Artists will learn how to look for changes in value on any surface, learn how to create many values in order to achieve 3-dimensional form, how to work with a light source, and how to create the natural forms found in nature. Chapter 4 – Adding Color to a Toned Form: The essential skills of toning and burnishing in colored pencil are discussed. These skills are required if artists are to convincingly render form in color. Hollender demonstrates how to hang onto form while applying color. Chapter 5 – Establishing Perspective: Creating a 3-dimensional form on a flat piece of paper is simply not possible without being able to see and draw in perspective. Artists will learn how to do both in this chapter. Chapter 6 – Putting Value and Perspective Together: Applying the techniques learned in Chapter 5, Hollender demonstrates how line, tone, and perspective work together to create natural forms. Chapter 7 – Understanding Color: Color theory, color mixing, and color harmony are the focus of this chapter. Carefully planned exercises enable artists to experience these concepts, not just read about them. Chapter 8 – Depicting Overlapping Elements & Different Planes: Drawing an individual flower or leaf is fine, but plants don’t produce free-standing leaves and flowers. Plants have branches, clusters of flowers, and leaves of all shapes and sizes overlapping each other. How do you get all of this down on a piece of paper? This is what this chapter is about. 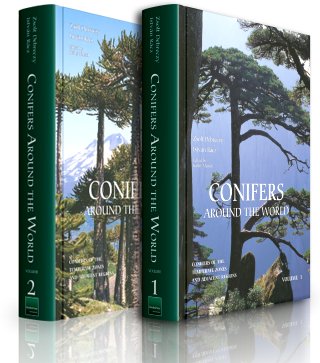 Chapter 9 – Understanding the Form & Function of Plants: Plant morphology, growth patterns, and working with a microscope are the focus of this chapter. Artists will learn how to design an herbarium page and a sketchbook page when studying plant specimens. Chapter 10 – Mastering Advanced Drawing Techniques: In this chapter, artists will apply what they’ve learned about form, perspective, overlapping elements, and color to create a finished drawing. Chapter 11 – Mastering Advanced Compositions & Techniques: Hollender describes how to plan and evaluate eye-pleasing compositions and how to use alternative backgrounds. She also demonstrates how to work with watercolor pencils, how to create a colored pencil painting of a white flower, and how to capture the intricate details of a flower’s reproductive parts so that the centers of your flowers are as alive as the rest of your drawing. Botanical Drawing in Color: A Basic Guide to Mastering Realistic Form and Naturalistic Color is far from basic. 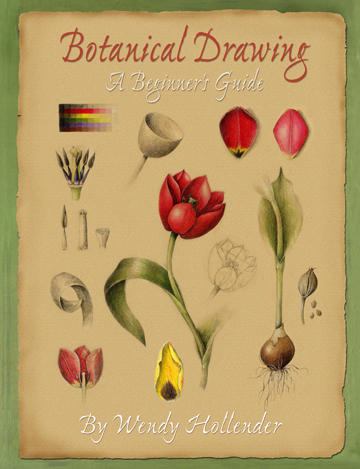 This all-inclusive guide is sure to enhance the work of botanical artists and jump-start the career of beginners who have been wanting to explore botanical illustration, but were too intimidated by the process. Hollender’s approach to botanical drawing is doable and no-fuss. All one needs is paper, pencil, and colored pencils. Watch Wendy Hollender at work on YouTube. Our April 2008 “Ask The Artist” with Wendy Hollender is the most read article to date at ArtPlantae Today? Botanical Drawing in Color sky-rocketed to the #2 position on the Nielsen Bookscan Ratings during its first week? Botanical Drawing in Color is already in its second printing? Buy this book online from your local independent bookstore.